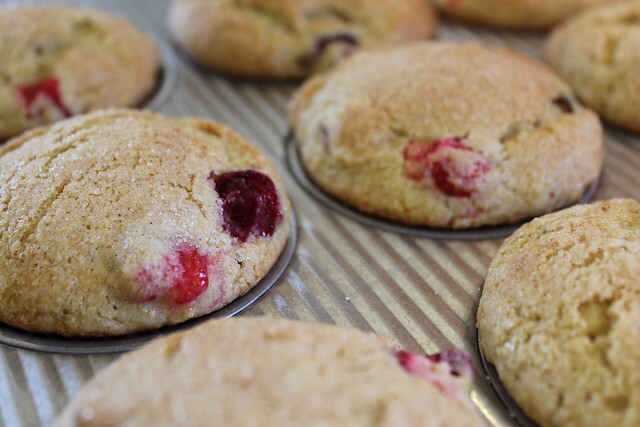 I love cranberries… especially the tart *pop* that they give to holiday recipes & muffins! I could not find a single Dairy & Gluten Free Orange Cranberry Muffin recipe online that tasted good… so I came up with my own. 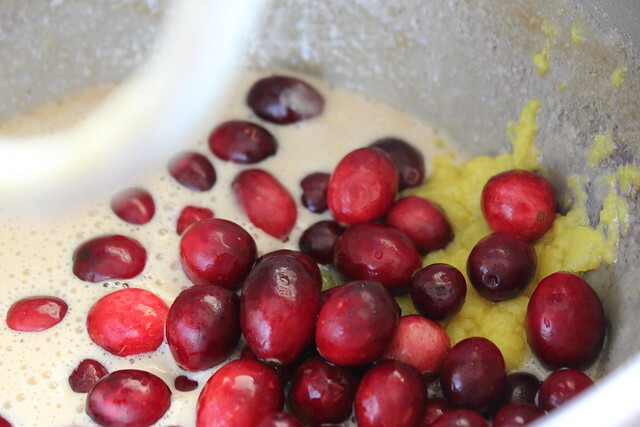 I felt a little like Goldilocks while coming up with this recipe… With my first batch, I tried natural dried cranberries – but those just didn’t have the same zing as fresh cranberries; The second batch didn’t have enough orange zest to balance the two flavors; But, the third batch was just right! You’d never know they’re Dairy & Gluten free! Just in time for Thanksgiving & Christmas… Here is my version of the perfect Gluten Free Orange Cranberry Muffin Recipe… Enjoy! 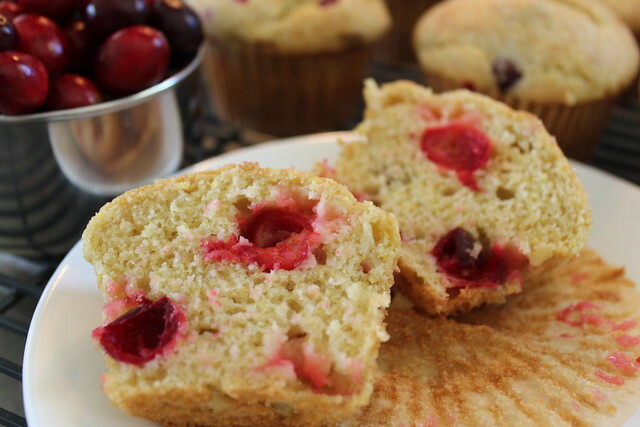 This Gluten Free Orange Cranberry Muffin Recipe is Dairy Free & Delicious! 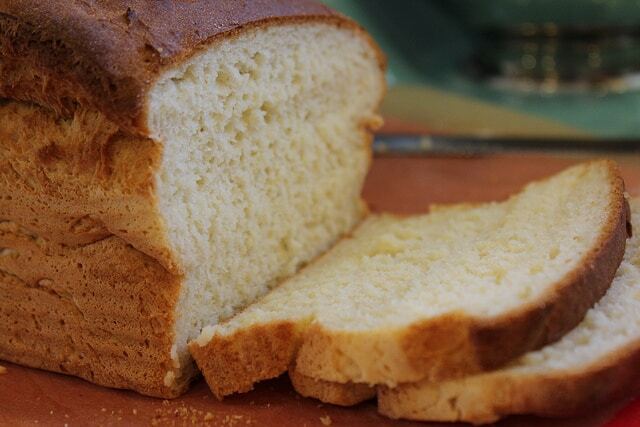 It’s so light & moist that you won’t even know it’s Gluten Free. Recipe can easily be doubled if you need more. 1 Cup Orange Puree with Zest from 1 Orange (see instructions below). Line your Muffin Pan with Paper or Spray with Non-Stick Spray if necessary. In a Separate bowl, combine the Dry Ingredients and set-aside. Puree your Orange by taking 1-2 Oranges (enough to make 1 cup of Puree) with the rind removed (and de-seeded if you don’t have a VitaMix). Then I add the Oranges WITH the Zest from 1 Orange into my VitaMix and blend until smooth. In your Stand Mixer, beat the 2 eggs on Medium speed for 1 minute. Gradually pour in your sugar and mix for an additional 1 minute. Gradually pour in your oil and beat for an additional 1 minute – mixture should be light and fluffy at this point. 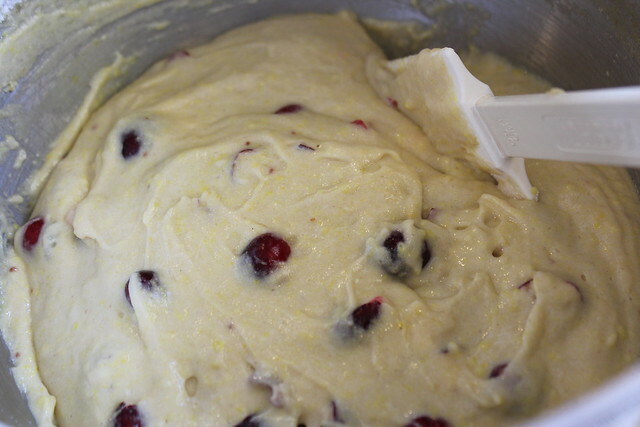 Stop the Mixer and add your Vanilla, Cranberries & Orange Puree. Mix lightly until well blended. With the mixer running on low, gradually add in your Dry Ingredient Mixture and then blend for about 30 seconds on Medium speed to ensure all ingredients are well incorporated. Divide the mixture into your prepared muffin pan and bake at 350 for 20 – 25 minutes until a toothpick comes out clean. I use my digital pen thermometer to ensure the muffins reach an internal temperature of approx. 200 degrees. Serve warm or store in an airtight container once completely cooled. Time Saving Tip: Instead of taking the time to zest the entire orange, I just slice a thin top layer of the zest and throw it in with the orange (without the rind) into my VitaMix before blending it. This saves me a lot of time and it turns out the same. « Vitamix Certified Reconditioned On Sale! I have made these 3 times and they always come out perfect! I used coconut oil this last time and they are delish! 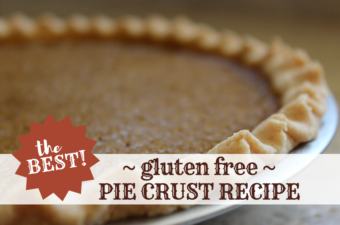 Thanks for sharing this recipe, it’s a new family favorite! Thanks for the great feedback… these are a family favorite for us too! I also use coconut oil and love the flavor and smell! And your time saving tip is GREAT! I have used this method myself, but never thought to post it. I have added it to the recipe instructions above. I used a minneola instead of an orange because that’s what I had. My husband says the cranberries are tart- but I love it! I pretty much followed the recipe exactly. I estimated for the flour mix: 2/3 c brown rice, 2/3 c tapioca, 1/3 sweet rice, 1/3 white rice, and 1/2 tsp xathan. Also I used demerara sugar instead of table sugar. Thanks for the recipe! You’re my kinda gal… able to adapt a recipe on the fly and it still turns out great! =) So glad you enjoyed them! I don’t have access to my old GF cran-orange muffin recipe and was desperate to find another. I chose this one out of four possible contenders. They are in the oven right now, and I can’t wait to taste how they come out! Two things though…in the instructions it says “preheat oven to 375,” but later “bake at 350…” So I am baking at 350 since that is the typical bake temp. Also, no instructions to sprinkle the sugar on top before baking (I did remember though). The batter was very orange-y, which I like and is not always the case with these recipes. I will update and let you know how they come out. If you would, please advise re: baking temp. Thanks! I did not have any cranberries so I made this with just blueberries then again with the oranges and blueberries…YUMMY! The whole family loved this recipe. I also substituted applesauce for eggs. Oh so good! 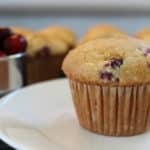 I have Celiac and I Love Orange Cranberry Muffins, I came across you today when looking for a recipe for Muffins. I can’t wait to try them out. I was also glad to find the Gluten Free Flour Mix as well. My granddaughter has Asperger’s Syndrome and I am trying her on a Gluten Free diet as well. Glad I found you today. I use to small clementines for the liquid and i do’t measure it. Maybe it’s not enough liquid? Otherwise , they taste great!!! I added waaay more liquid, but they don’t look as smooth and soft as yours on the top. Mine still look dryer and are lumpy. This happens with my CC cookies too. Do you know why? Hi Erika – making these yummy muffins a second time tonight! My husband loved them the first time so I’m surprising him by baking another batch. 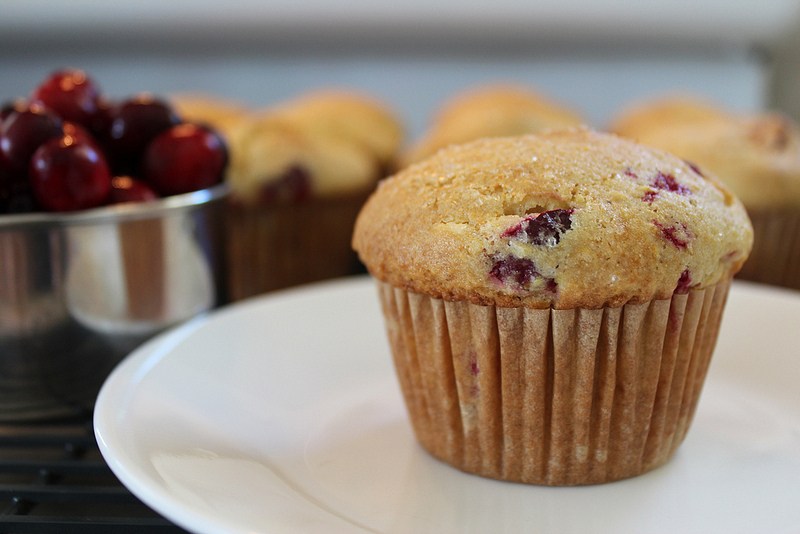 One questions – do you sprinkle the sugar on the muffins before baking for the topping? Normal sugar or crystals? Thanks! Amazing gluten free muffin recipe! Great balance of tart and sweet flavors. I used veggie oil instead of canola, maybe I’ll try coconut oil next time. 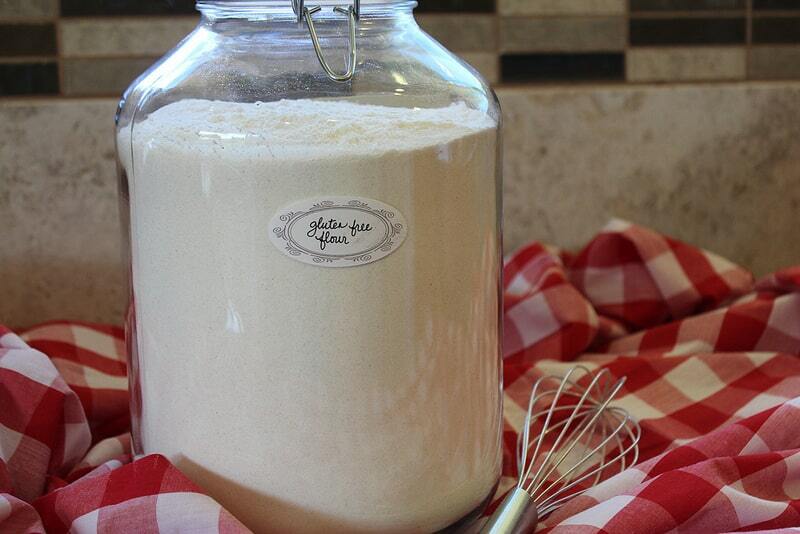 I used Bob’s Red Mill Baking Flour which has very similar ingredients to Erika’s flour blend. Also, took the tip about the Demarara Sugar sprinkled on top. So great to try a GF recipe and actually have it end up delicious! Made these a second time. Followed the recipe exactly. Love love love them! Thank you so much for this recipe! So much better than any store bought! 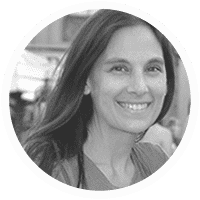 Hi Erika, I want to thank you for your wonderful web site. I had decided to go gluten free because of the benefits to my joints. Then, amazingly, my grandson was born with multiple food allergies…wheat, nuts, eggs, dairy. Yikes! I want to make these muffins for him. 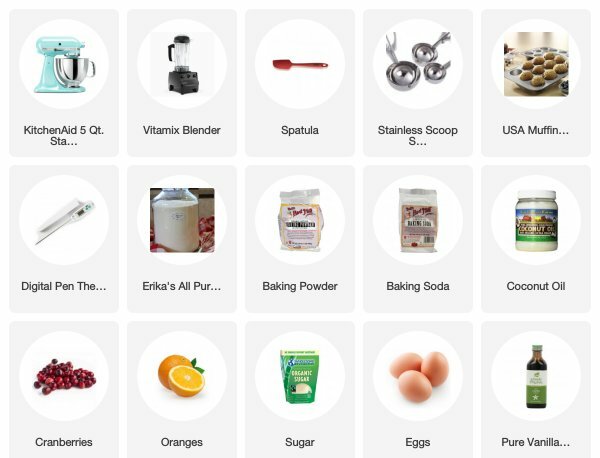 Can you use egg replacer or the applesauce suggestion above. 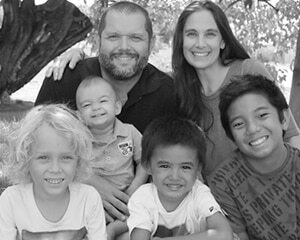 Thank you very much and God bless you and your wonderful family. my mom gave me 6 pounds of dried cranberries. Is there a way to adapt for them? Hi I can’t use coconut oil. Can I use olive oil instead? It’s 4:00 AM and I can’t wait to try this recipe in a couple hours. One thought, though, for serious consideration. You mention four beautiful adopted boys. While that is wonderful, I do think the situation would be improved by also adopting a grandmother (even if they have some now!) And I am volunteering. I do have grandma experience and this would benefit your boys by having less wait time for Parties with Grandma. Contact me at your earliest convenience. I’m ready! If you desire an interview, I’ll happily enjoy multiple test parties.? These were excellent! Light, fluffy texture and just the perfect sweetness- I used 3/4 C coconut sugar in the recipe and a generous sprinkling of coconut sugar on top. I also used Bob’s Red Mill GF baking mix. The family loved them and didn’t even know they were gf! A “keeper”. Thank you! These turned out amazing. I used dried cherries instead of cranberries. I’m not sure if it was the recipe or the gf flour I used (cup4cup), but best consistency of a gf baked good that I’ve found yet. Delicious. I don’t have a vitamix – just used my normal blender. Nor a stand mixer – just used electric beaters. My batter was much dryer than in the picture but regardless they were incredible! I didn’t know where to get this information to you. Since I just made gluten free muffins, I am putting it here. I was invited to a neighbors for dinner a while back. She served cornbread and commented that “If you use buttermilk in the recipe, it binds together better and does not crumble.” I used buttermilk in my muffins and they are not crumbly and stay together. I prepared this recipe and had to substitute 1/2 cup of GF for regular flour (run out of GF!). Also, I only used a bit more than 1/2 cup of sugar (Trader Joe’s organic is sweeter than other brands) and used frozen berries instead of cranberries. They turned out fluffy and flavorful! My kids loved them! Thank you! Excellent recipe! I tried these today for the first time and wow I was impressed! They didn’t have the dense feeling that is usually associated with gluten free but instead they were really light and airy!! I use Aldi’s baking mix and it turned out well. My non GF husband even approved of these! He said these are the best ones yet :) Thanks again!